PARIS, France, June 24, 2011 (ENS) – A proposed commercial highway that would have bisected the Serengeti National Park, jeopardizing the world’s last great migration of mammals, has been put on hold, the Tanzanian government has told the UNESCO World Heritage Committee meeting in Paris. The government of Tanzania wanted to build a high-speed highway across a pristine, remote wilderness area of the park, which is World Heritage site, to link the Lake Victoria area with eastern Tanzania. Survey markers are already in place. Ezekiel Maige, Tanzania’s minister of natural resources and tourism, confirmed Thursday that the planned road would be halted pending more study, and the existing tourist route would remain a gravel road, while roads outside the park to district capitals would be upgraded. “This decision has been reached in order to address the increasing socio-economic needs of the rural communities in northern Tanzania, while safeguarding the Outstanding Universal Value of Serengeti National Park,” said the minister. Serengeti National Park is the world’s largest protected grassland and savannah ecosystem. A paved road used by high-speed traffic to cross the Serengeti would act as a pathway for invasive plants, animals and diseases as well as poachers to penetrate the park’s pristine areas, conservationists warn. Poaching already poses the primary management challenge in both the Serengeti National Park and the adjacent Masai Mara Game Reserve in Kenya, which form part of a contiguous ecosystem. Shaped by the circular march of some two million herbivores, including wildebeest and zebra searching for forage and water, the Serengeti supports one of the world’s highest concentrations of large predators, and is inhabited by over 450 bird species. 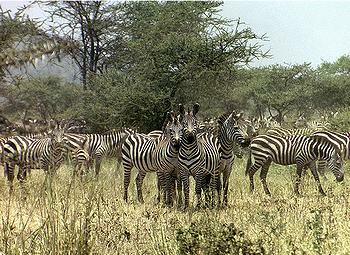 The park and the migrating animals are of great importance for Tanzania’s tourism industry and the country’s economy. Tourism is Tanzania’s largest foreign revenue earner. It raised over US$1 billion in 2009 and provided more than 600,000 jobs. 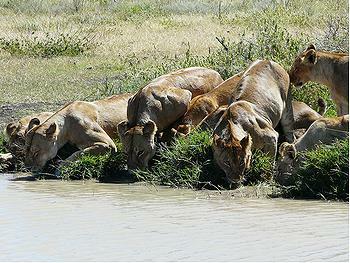 The Serengeti is Tanzania’s premier tourist destination, attracting more visitors than any other place in the country. The government’s decision means that tracks through the northern Serengeti will continue to be managed by Tanzania National Parks, known as TANAPA. By 2015, the proposed road would have been used by 800 vehicles a day, about one every two minutes. By 2035, by at least 3,000 vehicles a day, one every 30 seconds, would have used the road, according to Tanzanian government figures. Vehicle-wildlife collisions would have been inevitable. 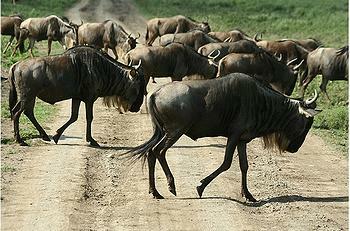 The road would have acted as a barrier to migrating herds of wildebeest, and the effects on predators that depend on wildebeest, including one of the world’s most important lion populations, would have been catastrophic, wildlife experts warn. 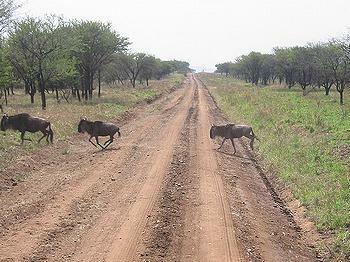 Experts from the Frankfurt Zoological Society calculated that if the road were to be built, it is likely the population of 1.8 million animals would drop by a third, spelling the end of the great migration. According to the government’s new plan, tarmac roads will not reach the border of the park but will end at Mugumu to the west, 12 kilometers from the border, and Loliondo to the east, 57.6 km from the border, leaving fragile habitat on both sides of the park undisturbed by tarmac roads. Earlier this year, the German Federal Minister for Development Dirk Niebel announced that Germany would be willing to finance a study on alternative ways of connecting areas bordering the Serengeti in the north to the existing road network, without crossing the Serengeti. Niebel also reaffirmed Germany’s willingness jointly to finance an international feasibility study for an alternative southern bypass for the national park. “This is a very welcome step in the right direction,” said Thomas Tennhardt, vice president of NABU, the Nature And Biodiversity Conservation Union, the German BirdLife Partner and one of the oldest and biggest environment associations in Germany.